MDOT ridership statistics show rail has seen an increased annual ridership of 78% since 2002. University students compose a large and influential percentage of passenger rail users in the state of Michigan. Recent trends show more than a decade long increase in users of Michigan’s rail system. A 2009 University of Michigan study for MDOT revealed 14% of all Michigan passengers were university students, and an additional 9% were other students. Overwhelmingly, rail users from the U-M study were young: one of every three respondents was under 25, and more than half of all respondents were under 35. The Ann Arbor News highlighted Ann Arbor as the busiest stop on the Wolverine line, supported surely by the travel of U-M students. Nationally Joseph Szabo, administrator of the Federal Railroad Association, wrote in his written statement to the Senate Surface Transportation Subcommittee on June 3rd, that “studies show the trend away from driving is being led by youth” citing that between 2001 and 2009, 16 to 34 year olds decreased their average number of vehicle-miles traveled by 23 percent and increased their passenger miles traveled on trains and buses by 40 percent. 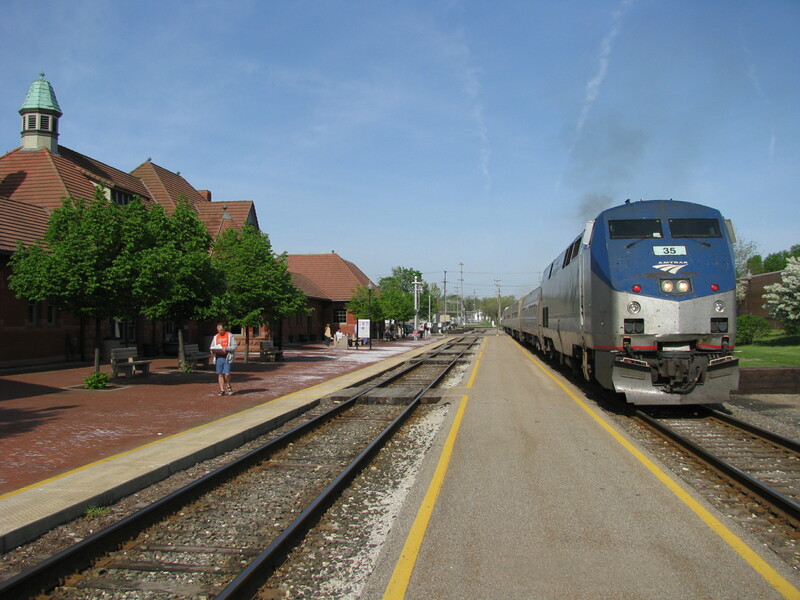 An enjoyable passenger experience is a focus of MDOT and Amtrak as they make improvements this summer to these popular routes. MDOT’s Michigan State Rail Plan, outlines a plan for the future extension of passenger rail across the state, but Michael Frezell of MDOT Rail also addresses the desire to make rail “more competitive to cars in the long run” with “improved timeliness” and free wireless internet access so passengers can be more productive than if they were just sitting in traffic. These improvements focus on the benefits that many students, like Nick, have already realized about using passenger rail. While changes are being made this summer Amtrak has added increased service on Sunday and Monday to the Blue Water and Wolverine Lines. Chicago attracts many recent graduates from Michigan Universities, but trains can be an important lifeline to bring these alumni back into the state. The Chicago area hosts a population of over 25,000 MSU alumni. Prima Civitas, a non-profit interested in community building in the state, teamed up with MSU affiliates to designate a special Spartan car on the Blue Water Line. 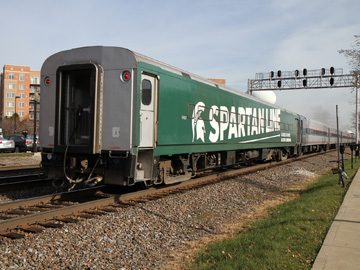 Decorated in green and white, the initiative began in 2012 as close to 60 passengers took the train into East Lansing, with tickets to a Spartan football game included in the price of a ride. The Spartan Line Initiative addresses the desire of many alumni to come back for big events in East Lansing. Growth in statewide passenger rail can help encourage millennials to stay in Michigan, while increased regional rail options can help bring young adults back into the state. The rate at which those under 35 choose passenger rail for long trips proves it is a viable alternative to the single passenger automobile with an added economic benefit to the state overall. This post is re-posted from the Trans4M Blog, and appears in its original form here.